I had visions of TRON as well, but I think they're docked. It's a fun way to introduce chests and loot into The End though. 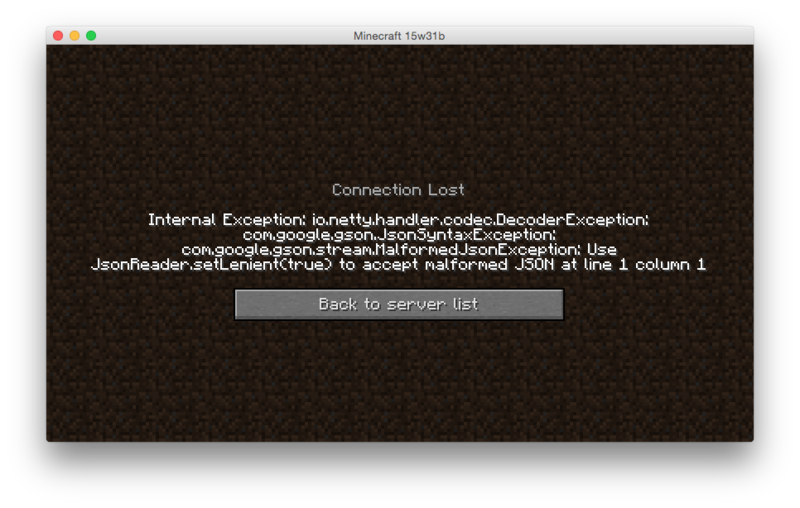 Man, this is making me feel the need to test for upgrading our server. I was looking at going to 1.8.8 or whatever is current but have held off. Wait, do you have the means now to trim The End and The Nether? I thought those were wipe-only. It sounds like the new pillars required for the main End Island will just propagate somehow without a wipe, but I don't know. Just give us ample warning before the update so Grey and I can remove the loot down in the End if we need to. I would certainly do that if we are able to make such a thing happen. I'm just going to try to test off production first and will report back what I find. I'm going to try with one that I upgraded to 1.8.8 and see how it works. If that isn't fixed in updates to the 1.9 version it might mean a wipe. If those are all mobs, then we could possibly kill all mobs (horses included) and save the buildings. Not sure at this point. Going to 1.9 with this map is not currently an option though. 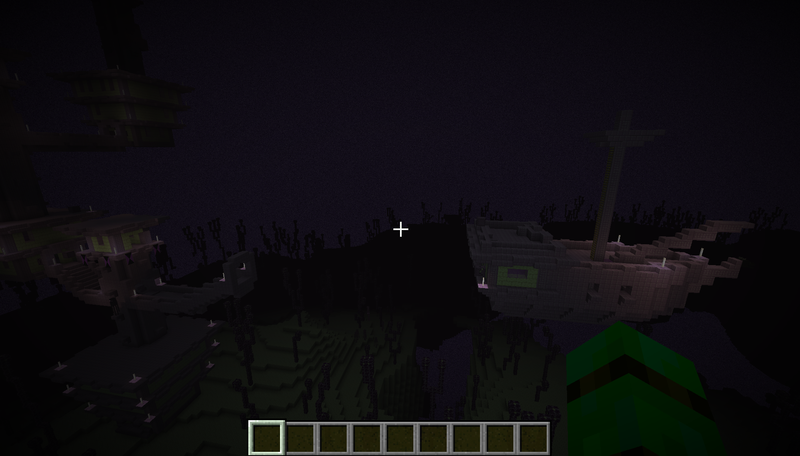 I've filed two bug reports in hopes that this will get sorted out without having to wipe the world to get to 1.9. I'll keep you guys posted on the results. Yeah, this is just a snapshot, not even a pre-release. We're months away from getting a stable 1.9. If we have to start over, I say we have a destructo party, let some big mobs loose in the world and let them tear the hell out of it! We'd know by now if 1.9 was a wipe-world. People are updating their 1.8s with no problems, so I'd give it a while to iron out some more kinks. Really...I'm not able to upgrade our world at all. It is broken bad on upgrade. I'm also unable to log into the game at all with my client and it's a default client. This is also for 15w31c. I am now linked to two bug reports for people with the same issues. Someone over on reddit did an End test going from 1.8 to 1.9 and it's pretty interesting. Doesn't look all that bad for our XP trap. Good to know it will survive. What about getting a tree thing in there though. That would be very cool I think. I might have to stop and try to play with that some this weekend. I think all the new stuff like the trees and weird strongholds live on the new ring of islands that will pop up around our main island in 1.9. Will those islands then interfere with the trap working by putting a place for Endmen to spawn near the trap? We would have to mine it away or cover it with something they won't spawn on. I thought the islands were something like a thousand blocks from the main island? If that is the case, there should be no interference. Well then that it pretty nice. I've not been looking stuff up about it. I'm looking forward to the update though. So we will then be expanding The End like we do the over-world? I wonder if I can map it like the over-world? 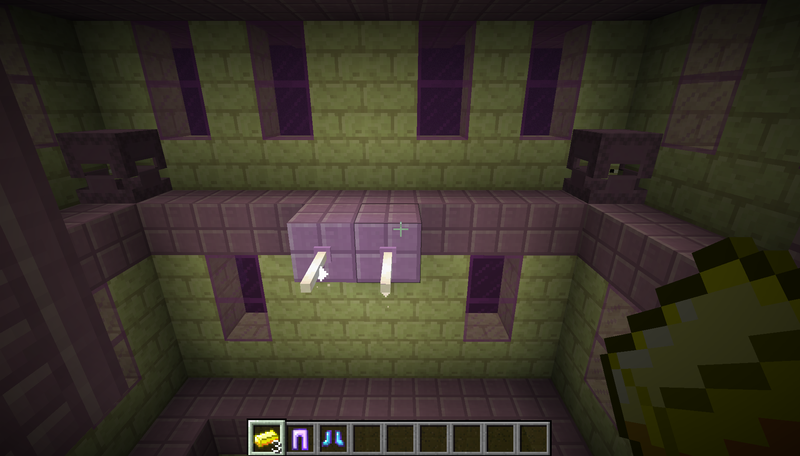 If it's multidimensional (like the Nether) it may become just a confused mess. Yes, the ring of islands will start around a couple thousand blocks out from the main island, then go out from there to MCinfinity. It will be a fun bridge to build. I suspect glass floor with yellow glass rails. endstone w/ purple rails, weirdo. Not that it will happen.. I mean, imagine building a rail from downtown all the way out to Elysium's place. That's pretty much the scale. So... Ken's in. Anyone else? *an aside: coincidentally, for the first time ever I was out at Elysium's underwater monument today. It's a nice find, and the portal build is fun and safe. I spent some quality time out there just watching squids get zapped. Relaxing. I'm in to help build the (rail) bridge as needed. Should be fun! We can cover it like the path to the XP trap with water and have a safe trip all the way there! Foot path can be made too for those that have an urge to run there for some reasons. ...and things that peak at you! So there will certainly not be an issue with our current The End configuration. The trap will continue to work perfectly. I would highly recommend that the bridges be rails and not walking paths. Man that is a long way away even flying! It really is about 1000 blocks from 0,0. Hey T – what's the chance of getting the latest snapshot on the side? I'm sure it'd be fun for all to play with the wings, but I have a small test that I need a willing participant for, and it only works in 1.9. The park will more interesting than I thought. So fun. I would be happy to... I'll let you know when it's running. I want a BRANT NEWT WURLD. Thanks. No rush at all. I just need to push Ken in a minecart and shoot him. Why not both? 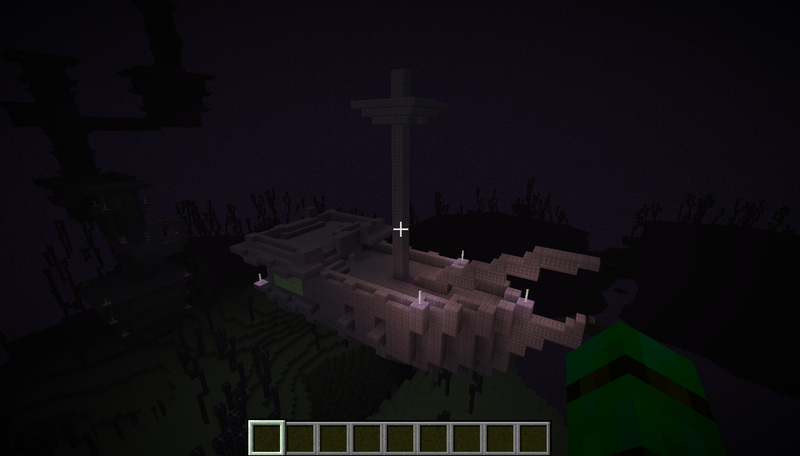 I'd love an area 10k+ blocks away from spawn that was settled much like Loch Greene or the Tekkit world. Could be on the honor system that you don't bring anything there from 'the city' and don't bring anything back. I love roughing it in MC as much as anybody, but I also like coming back home and swimming in my piles of redstone dust. 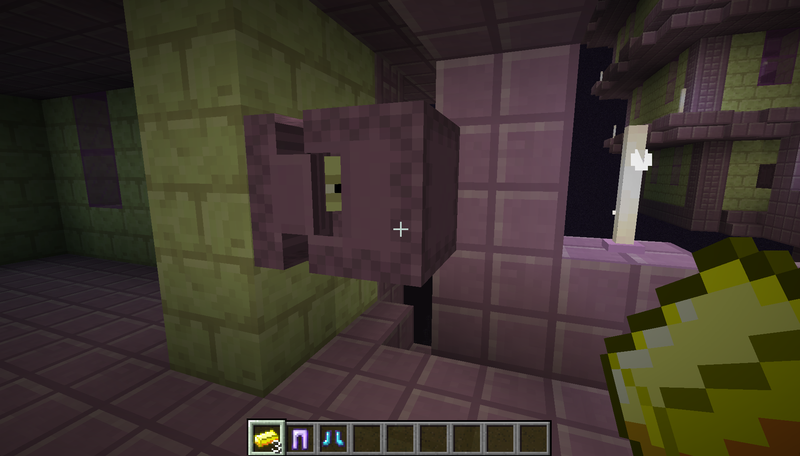 As far as a clean wipe, I think we'll get one in 2.0, honestly, with cubic chunks becoming a thing.